Ever wonder how bartenders use honey with ice and avoid the clumpy mess? * Simple - Honey Syrup. If you have ever tried making simple syrup, honey syrup uses basically the same steps, but it's even easier and more delicious. 2. In a small saucepan combine honey and water over medium heat. Stir until the honey dissolves and is mixed completely with the water. There is no need for it to boil. 3. Remove from heat and let it cool to room temperature. I recycle my old honey jars to store the honey syrup. 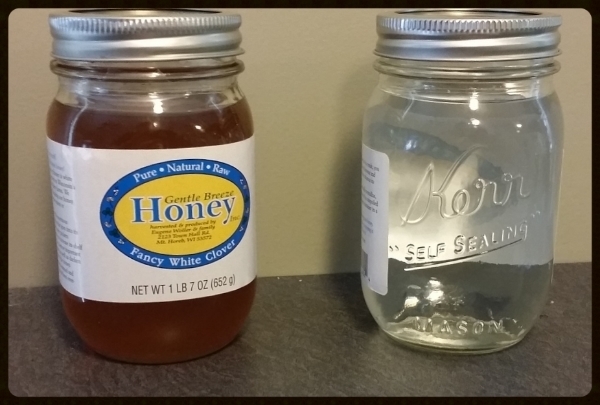 You can see it's slightly lighter in color now than the original honey pictured above. Keep the honey syrup refrigerated and it should last up to two weeks. *Stay tuned for my favorite three-ingredient cocktails, one of which uses honey syrup to great effect.